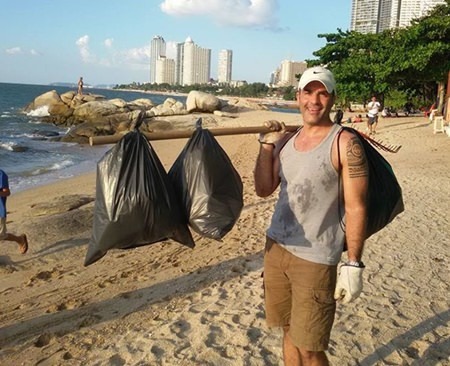 An Australian expat who spends his spare time cleaning up Wong Amat Beach has earned the admiration of both Pattaya locals and social-media users countrywide. Mark Blackburn, 41, is an executive with Chassis Brakes, which produces vehicle brakes in Rayong. He works Monday to Friday, but uses his off hours in the mornings and weekends collecting rubbish along Wong Amat Beach. He spends at least two or three hours a day, depending on the amount of trash that needs to be collected. He also sometimes goes to Koh Larn to clean up beaches there as well. Blackburn said he’s been walking the beach with his own black plastic bags and rubbish bin for about six months now. The reason? He loves Thailand, its people and the environment. He said if he can be of any help to society, he wants to do it and hopes others will join in, or at least dispose of their trash property instead of littering. Pitak Buathong, owner of the Buathong Restaurant at Wong Amat, said people have noticed the foreigner taking better care of Thailand’s beaches than most Thais and were impressed. One snapped a photo and posted it to Facebook and Blackburn’s 15 minutes of fame starting ticking. The post went viral with thousands of shares and comments. Pitak said he hopes it will encourage both Thais and tourists to be more tidy. “I never knew that somebody would come and take a photo of me and post it online, but the results were great because it did encourage others to do the same,” Blackburn said.